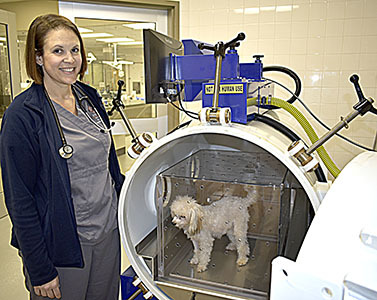 Dr. Lenore Bacek and Toby — a dog owned by one of the CVM staff members — demonstrate how a patient is placed in the hyperbaric oxygen chamber for treatment. Pet owners now have the option of receiving hyperbaric oxygen therapy as a part of their animal’s healing and recovery treatment through the College of Veterinary Medicine (CVM). The new veterinary hyperbaric chamber was recently installed in the Wilford and Kate Bailey Small Animal Teaching Hospital. Although hyperbaric oxygen therapy is used worldwide in human medicine, its use in veterinary medicine is relatively new, occurring primarily during the past decade. Hyperbaric chamber technology is being used by a small number of veterinary practices and an even smaller number of academic institutions throughout the United States. Auburn is one of the small number of veterinary medicine colleges offering hyperbaric oxygen therapy, according to Dr. Lenore Bacek, assistant clinical professor and head of the Emergency and Critical Care service section. During veterinary hyperbaric oxygen therapy the patient is placed safely and comfortably in a hyperbaric chamber designed specifically for small animals. At a maximum of 2 Atmospheric Pressure (ATA), and closely monitored by trained staff, 100 percent pure oxygen treatments are given one – two times daily. Treatments may last from 30 minutes to 2 hours, depending on the prescribed therapy, Dr. Bacek explains. The total number of treatments necessary varies according to the type of treatment and the patient’s response. Most patients appear calm and relaxed during hyperbaric oxygen therapy. Many even fall asleep. Therapy sessions are continuously monitored by certified technicians and veterinarians, with some 15 CVM technicians and veterinarians currently trained to administer hyperbaric oxygen therapy, Dr. Bacek said. Hyperbaric oxygen therapy also is available to referring veterinarians for their patient-clients. According to publicly available medical literature, hyperbaric oxygen therapy results in reduction in swelling, stimulation of new blood vessel formation into the healing/swollen tissue, a reduction in pressure caused by head or spinal cord injuries, improved would healing, and improved infection control. Hyperbaric oxygen therapy can be of great help to veterinary patients by speeding up the healing process and may reduce or eliminate the need for more invasive procedures such as surgery, oftentimes resulting in a net savings of time and cost of treatment for pet owners. For more information about the hyperbaric oxygen therapy at Auburn CVM, contact the hospital at 334.844.4690, or visit its web site at www.vetmed.auburn.edu.